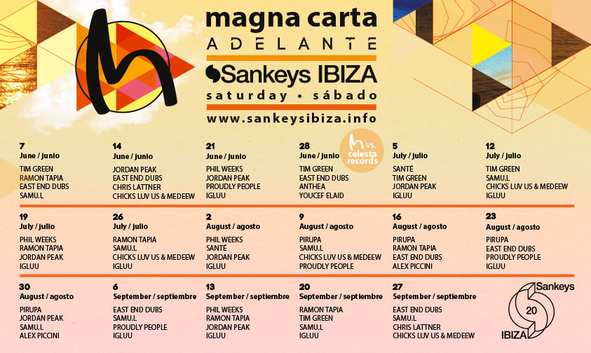 Magna Carta recently revealed their Saturday line-ups for their forthcoming season at Sankeys in Ibiza. The London night has hosted at the club before and representing them this summer will be the likes of Moon Harbour’s East End Dubs, Spaniard Ramon Tapia and the UK’s One Records’ regular Jordan Peak. Also playing will be label boss and DJ/producer Phil Weeks of Robsoul, fellow Frenchman Chris Lattner and many more, including Berlin’s Desolat talent Santè and Disco Over Music boss and Cocoon regular, Tim Green. The opening party on 7 June features Phil Weeks, Ramon Tapia, East End Dubs and techno producer Samu.L, whilst closing down the event on 27 September are East End Dubs, Chris Lattner, Chicks Luv Us & Medeew and Samu.L.